The candidate should have passed 10th Standard or equivalent examination with English as a subject of study. The age for admission of the candidate should be between 15 to 23 years and for SC/ST candidates it should be between 15 to 25 years as on 01.07.2018. Applications will be entertained only from the permanent residents of J&K State. 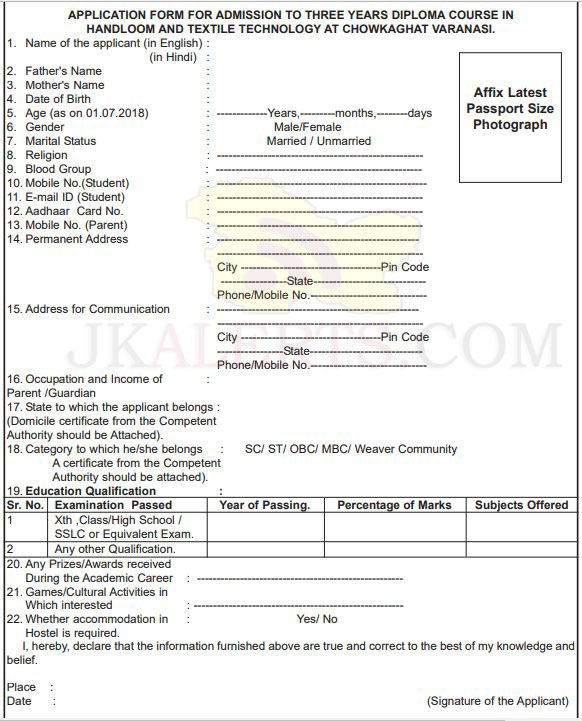 Application forms duly filled in and completed in all respects should be accompanied with the attested copies of Matriculation Certificate, Marks List, State Subject Certificate, Character Certificate, Fitness Certificate, Category Certificate and a Certificate belonging to Weaver’s family or experience certificate, if any. Each student admitted in the course as stipendiary student will be paid Rs.500/- per month in 1st year, Rs.550/- per month in 2nd year and Rs.600/-per month in 3rd year for the duration of course (tenable for 10 months from July to April). The student selected for admission is required to execute the stipend bond in the prescribed form. The expenditure towards stipend will be shared by the Central Govt, and State Govt, in the ratio of 50:50. 50% State share stipend will be paid to the students after receiving the amount from the concerned State Government for the duration of the course. Total No. of seats allotted to the State of J&K = 10 seats. As per the State Govt.Policy, in addition a minimum 20% of the total seats allotted to the States are reserved for Candidates belonging to Weavers’Community. Shortfall, if any, will be met out from the Candidates other than those belonging to Weavers’ Community. No T.A. /D.A. will be given to candidates for attending the counseling. The complete forms should either be sent by registered post or delivered personally in the office of the Joint Director, Handloom Dev. Deptt; Jawahar Lai Nehru Udyog Bhawan, 3rd Floor Rail Head Complex, Jammu /Joint Director, Handloom Development Department, 4th Floor, Sanat Ghar Bernina, Near Bernina Woolen Mills, Srinagar, by or before 10th June, 2018 along with all requisite enclosures.